I have so much pretty autumn photography to share with you all! I have been busy, trying to get out and about as much as I can before all the leaves drop. The weather is supposed to finally take a turn for the chilly and windy this week, so I got out twice this past week and weekend to capture as much of the golds, oranges, and reds as I could. 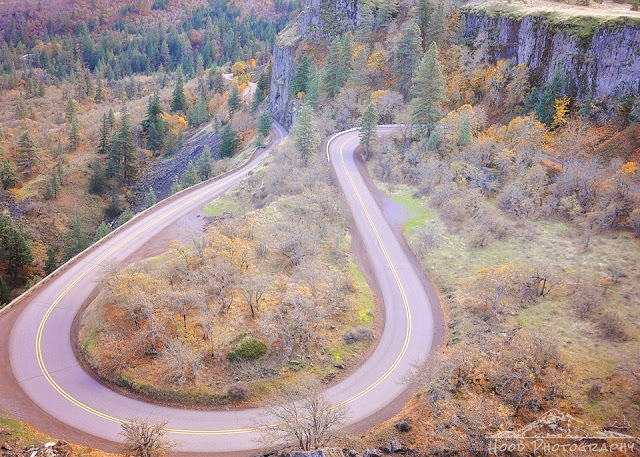 This is the Rowena Loops, which is a series of tight horseshoe curves that twists below the Rowena Overlook at McCall Point. This road is photographed very often, but I was lucky enough to capture some of the pretty fall colors in my take. Great Capture! Amazing road, lovely fall colours. We are coming into summer here in Australia and in Brisbane where I live we really need some rain! Beautiful scenery - but I bet it would be advisable to take that road slowly and soberly!!! Great shot, but the ROAD would be bad for my stomach! Color and composition are marvelous ~ Great photo for R! It would drive my dad nuts driving on a road like that. Nice view and road shot. What a beautiful setting. Colours are great. I bet motorcyclists love that part of the road! Wow lovely shaped road. I showed this to my 4yr old son who is traffic sign and road obsessed and he loves it! That is so beautiful! Autumn is a wonderful season to get some nice shots! Love the lines, would be fun to drive this road! Looks a spectacular autumn drive. Beautiful scenery and perspective. I like lovely fall colours. Cool perspective! Looks like a great road for beautiful scenery! Wow what a great road, gorgeous picture. Our kids get Car Sick...can only imagine what they would feel on this road! !